Meguiar's Boat/RV Pure Wax is a durable high gloss protection for fiberglass and painted surfaces. 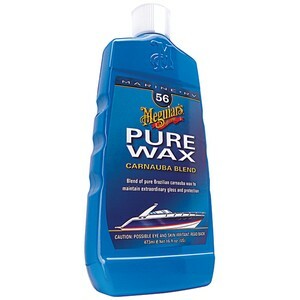 Meguiar's has engineered their Pure Wax with a blend of pure Brazilian carnauba wax with silicones, polymers, and resins to make sure your boat stays clean, protected, and keeps an exceptional gloss. Meguiar's Boat/RV Wax also protects against the sun's UV rays to fight off fading.